Of the dropout prevention interventions reviewed by the U.S. Department of Education's What Works Clearinghouse, Check & Connect is the only program found to have strong evidence of positive effects on staying in school. Check & Connect began in 1990 with a five-year grant from the Office of Special Education Programs, U.S. Department of Education. Since then, many grants have furthered the development of Check & Connect, including replication, efficacy, theory development, sustainability, adaptation, and evaluation studies. See Selected Findings and Current Research for details. 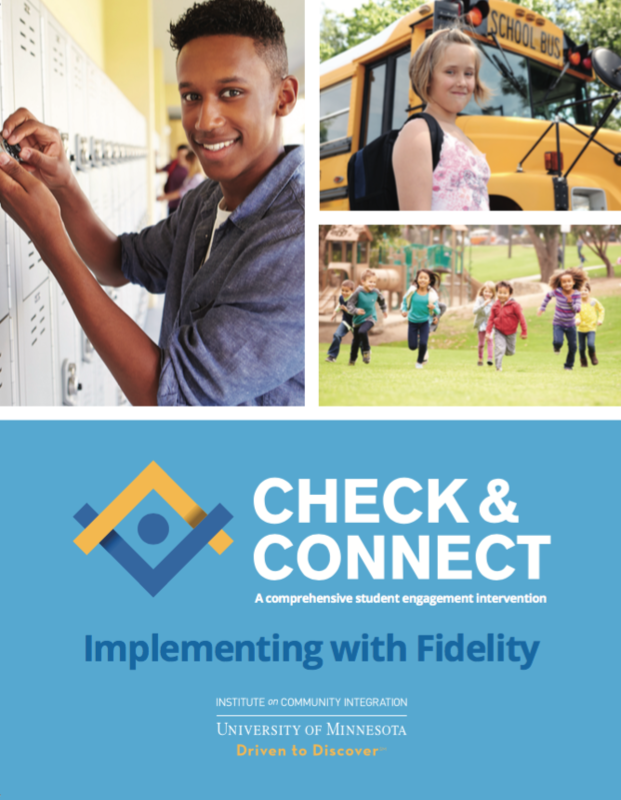 Because Check & Connect is an empirically-supported intervention, the goal of the Institute on Community Integration’s ongoing research agenda is to modify and improve Check & Connect to improve student outcomes. Of the dropout prevention interventions reviewed by the U.S. Department of Education's What Works Clearinghouse, Check & Connect is the only program found to have strong evidence of positive effects on staying in school. Read the blog article, A Tour of Check & Connect’s What Works Clearinghouse Report, part II in the series on evidence-based interventions in education. Establishing greater efficacy: For whom does Check & Connect work and under what conditions? Investigating student engagement: How can parents and teachers support student engagement? How can Check & Connect contribute to developing better environments for increasing student engagement? Developing a toolkit for Attend – Engage – Invest: What strategies promote each and all of these three steps (attending school, being engaged, and investing in one's future) toward full student engagement with school and learning? Adapting Check & Connect to other contexts: How has Check & Connect been adapted to other contexts and student populations? "While Check & Connect is structured, it is also flexible in using the resources that currently exist in a school. This combination of structure and flexibility make it very 'user friendly.'"